New figures released by the U.S. Treasury Department show that the national deficit rose to $779 billion during the 2018 fiscal year—a 17 percent increase over last year. As CNN reports, that’s the highest it’s been since 2012, when the country was spending an exorbitant amount of money to stimulate a recovering economy. The Committee for a Responsible Federal Budget warned that the deficit could hit $1 trillion as soon as next year. For reference sake, the record for highest budget deficit in U.S. history is $1.4 trillion, which occurred during the 2009 recession. The deficit is the difference between what the U.S. Government takes in from taxes and other revenues, called receipts, and the amount of money it spends, called outlays. The items included in the deficit are considered either on-budget or off-budget. You can think of the total debt as accumulated deficits plus accumulated off-budget surpluses. 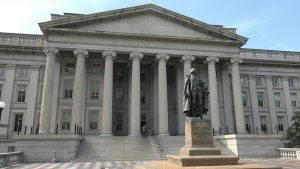 The on-budget deficits require the U.S. Treasury to borrow money to raise cash needed to keep the government operating. It borrows the money by selling securities to the public. The Treasury securities issued to the public and to the Government Trust Funds then become part of the total debt. According to CNN, there was no change in government receipts this year compared to last. There was, however, a 22 percent decrease in corporate tax collections due to the GOP-backed tax cut. Nevertheless, increased revenues from individual and self-employment taxes made up for the shortfall. 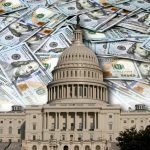 The increased deficit can be attributed to a 3 percent rise in government spending, mostly on the military, social security, and interest on the federal debt. Mick Mulvaney, White House budget director, said that President Trump is working on getting the country back on track. Did George Orwell Prefer Socialism or Free-Market Capitalism?